^ "Amazon Echo is now available for everyone to buy for $179.99, shipments start on July 14". Android Central. ^ "Amazon Unbundles Alexa Virtual Assistant From Echo With New Dev Tools". TechCrunch. AOL. 25 June 2015. ^ "Amazon Echo". Amazon.com. Retrieved 2016-08-02. ^ Kevin Tofel. "Amazon Echo just became much more useful with IFTTT support". ZDNet. ^ "Hey Alexa, Meet Yonomi". Yonomi. March 22, 2016. ^ "Amazon Echo controls Belkin WeMo and Philips Hue with your voice". Engadget. April 8, 2015. ^ Tofel, Kevin (July 9, 2015). "Amazon Echo can now control Wink smart home products". ZDNet. ^ Parkhurst, Emily (June 25, 2015). "Amazon makes $100M available to fund voice-control tech". Puget Sound Business Journal. 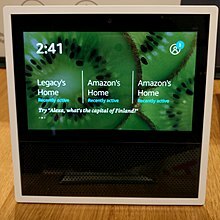 ^ Introducing Echo Show - Black. https://www.amazon.com/dp/B01J24C0TI. ^ "Amazon.com Help: Amazon.com Privacy Notice". amazon.com. ^ "Amazon Echo". Engadget. AOL.